We have seven housekeeping cabins. 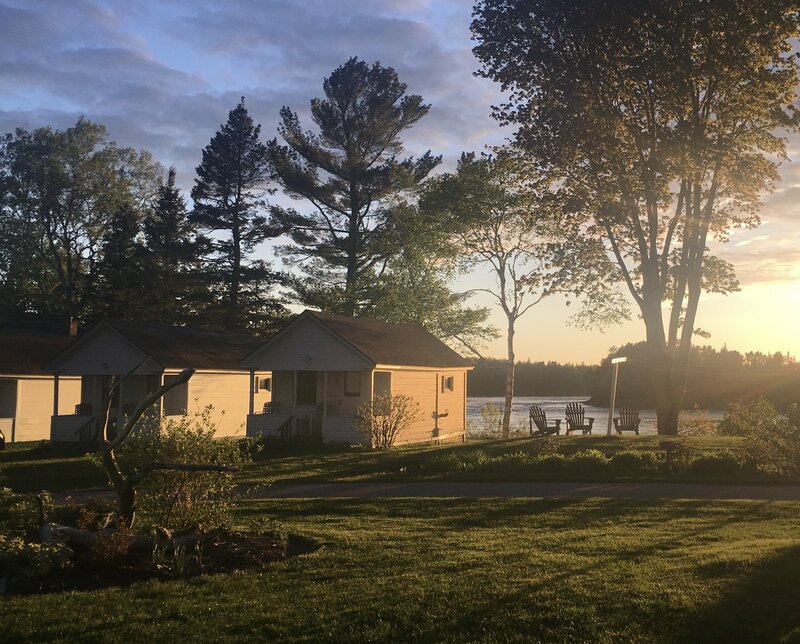 The cabins have refrigerators, stoves, stainless steel sinks, and stainless steel cooking utensils which are all adequate for vacation meal preparation. All of our cabins feature electric heat whenever needed for cool nights, as well as cable TV and WiFi. Cabins 1, 2 and 3 have eat-in kitchens with views to the west over the cove toward Tidal Falls. These cabins also have a double bed plus either a futon (Cabin 1), or a twin bed (Cabin 2 & 3). All three cabins also have a bathroom with either a shower (Cabin 1 & 2) or a shower/tub (Cabin 3). Each cabin has a front porch that looks to the south over Frenchman Bay. The Green Cabin has a spacious, full eat-in kitchen with views both west over the cove toward Tidal Falls, and to the south over Frenchman Bay. This cabin sleeps 4-6 people. The upstairs has one bedroom with two twin beds and one walk-through bedroom with one twin bed. The downstairs has one twin bed and one double futon in the common area. The bathroom and shower are on the first floor. This cabin also has a large wrap-around porch that looks to the south over Frenchman Bay. The Shore Cabin has a small galley kitchen with a living/dining area overlooking Frenchman Bay. This cabin has one bedroom with a queen bed and bathroom with a shower/tub. The front porch looks to the south and west, overlooking both Frenchman Bay and Tidal Falls. Cabin 4 has a galley kitchen overlooking east toward Sullivan Harbor, with a separate dining/living room overlooking Frenchman Bay. This cabin has either a king sized bed, or two twin sized bed, along with a double futon in the living room. There is one bathroom off the living room, which includes a shower. The wrap-around porch looks east toward Sullivan Harbor and south toward Frenchman Bay. The Winter Cabin is a two bedroom cabin that sleeps four, with a queen sized bed in one bedroom, and two twin sized beds in the other. The dining/living area has a Franklin fireplace and large picture window with views to the west over the cove towards Tidal Falls. The bathroom includes a shower/tub. A spacious wrap-around porch also looks west over the cove towards Tidal Falls. The Winter Cabin also has its own fire pit! The Winter Cabin is one of the few cabins along the coast that offers year round rental availability. In addition to the Franklin fireplace and electric heat, the cabin also includes cozy down comforters.